Numerous Native American burial grounds and mounds have been identified throughout Porter County. 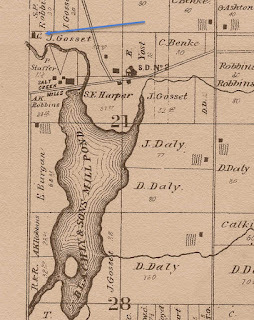 The first public document identifying such sites within the current boundaries of the county was produced in 1834, two years prior to the county's creation. Both the burial and mound building customs of Native Americans, including those of the pre-Columbian era, have varied widely, both geographically and through time. Differing environments, social structure, and spiritual beliefs led to a variety of burial practices. In the area surrounding and embracing Porter County, a common Native American practice was the erection of earthen mounds. These earthworks were typically either chambered mounds or crematory mounds. Several prominent Native American burial mounds once existed in Porter County. It has been reported that a total of at least 42 visibly identifiable Native American mounds and burial sites could be found in the county; here, 36 of these sites are identified based on published accounts of their existence. 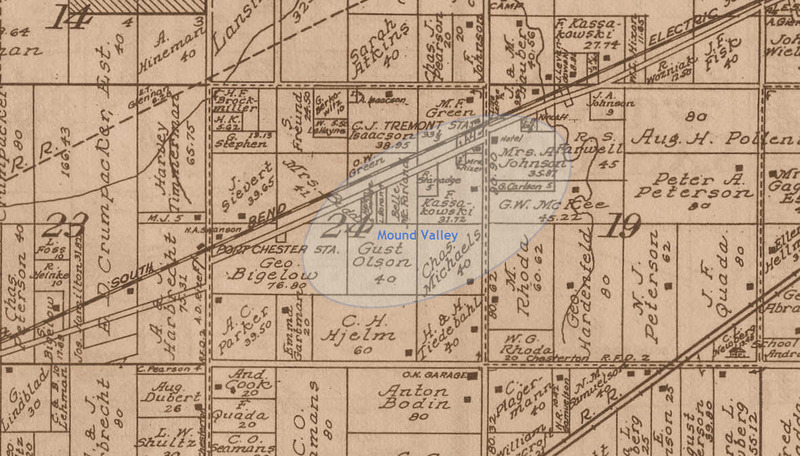 Today, few recognizable mounds exist in Porter County. The vast majority of mounds were destroyed by agricultural practices of the 1800s and early 1900s, whereby farmers plowed over the elevated landmasses or allowed their livestock to heavily graze a mound area. Some farmers intentionally leveled mounds with scrapers to make their work, and the work of the draft animals, less labor intensive. Other mounds were destroyed more recently. For instance, it has been reported that the area near the present day Dune Park Station along the South Shore line, east of Indiana State Road 49 and along U.S. Route 12, was once littered with mounds. Highway and road construction, rail line construction, drainage works, residential development (i.e., former village of Tremont), and sand and peat mining obliterated these mounds. Below is an enumeration, listed alphabetically by township, of known mounds and Native American burial grounds located within the boundaries of Porter County. Note that not all mounds were burial sites. For instance, piles of earth were often heaped into mounds for the purpose of elevating wigwams in low, wet areas. "Even today it is not uncommon to find arrow heads and stone hatchets in Boone Township. Immediately across what is now State Road No. 152 [now U.S. Route 231] from Hod Morrow's house near the Kankakee is an old Indian burial ground. J. M. Morrow recalls that together with his brother Hod and other boys of the community he has unearthed many arrow heads, hatchets and bones. He has a collection of these early relics. Some of the skeletons had been buried in a horizontal position, others in a sitting position. One tiny grave was uncovered and was encased on clam shells but containing no bones. This undoubtedly was the grave of an infant whose bones were not as yet ossified. It was not an uncommon practice for infants to be buried in hollow logs. We can well imagine that over these burial mounds the Indian squaws blacked their faces and cooked and ate their food as was their custom in mourning their departed. It is small wonder when they revisited these mounds, after they have moved westward, that they were shocked by the fate of the sacred burial places. In a visit to the burial ground just mentioned the writer in company with M. E. Dinsmoore found, in a matter of a few minutes, three arrow heads, a part of an Indian axe and several human bones. A corn field now covers the mound." "...the Morrow family has come upon burials in the sandy elevation, twenty rods east of the highway. A pipe is said to have been found with one burial. It is also reported by U. H. Morrow that mussel shells were placed with the burial, usually over the body. This was noted a number of times in burials found in several places on the sandy elevation. The site is now planted in corn." Hodson "Hod" Morrow, and other boys in the surrounding community in the 1880s. U.S. Route 231 traverses the boundary between Sections 26 and 27. Source: A. I. Silander & Company's 1928 Plat Book: Porter County, Indiana. "This is known generally throughout the region as an Indian burial ground." Several residential homes now exist on this site. 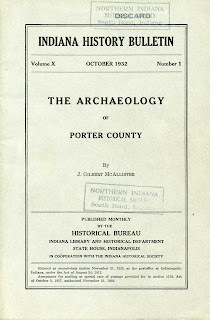 in McAllister's 1932 report concerning Porter County archaeology. 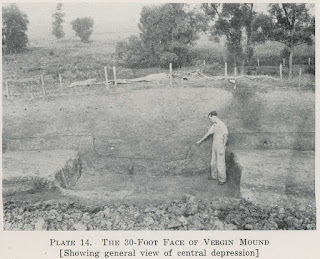 C. The Vergin Mound was a rather isolated and undisturbed until 1931 when J. Gilbert McAllister and his archaeological team excavated the mound, identified as Site 28. The mound was named after Richard and Doshia Vergin, owners of the property on which the mound is located at the time of its scientific excavation. The mound is situated in the southeast quarter of the northeast quarter of the southwest quarter of Section 5, Township 33 North, Range 6 West. In the 1930s, the mound's diameter was found to be 50 feet and it rose to a height of 4.5 feet above the surrounding elevation. Portions of five separate skeletons were uncovered during excavation. 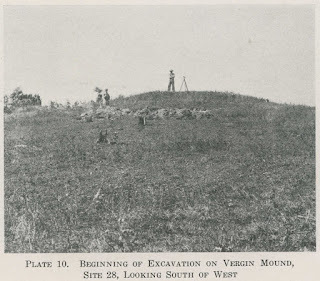 The Vergin Mound in Boone Township, prior to scientific excavation in 1931. 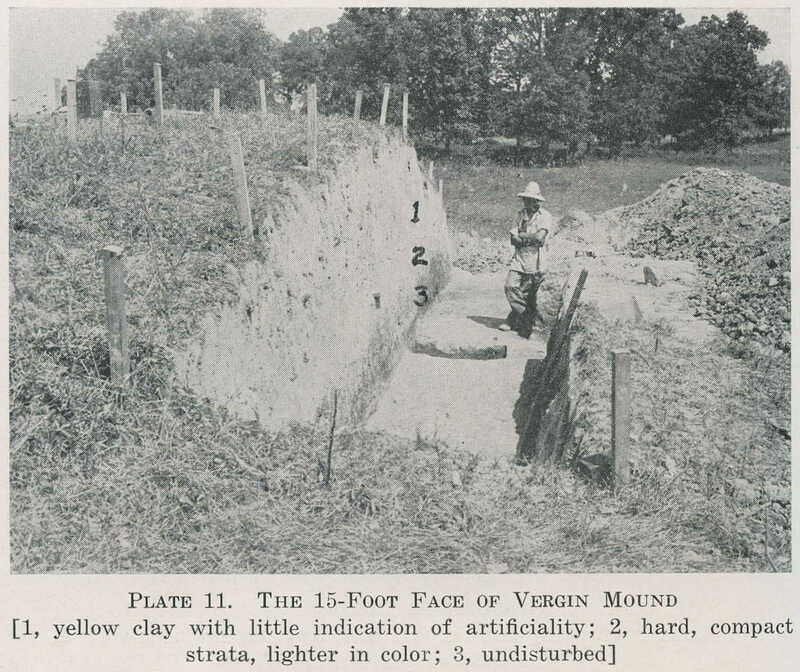 Archaeological excavation of the Vergin Mound in Boone Township in 1931.
made during archaeological excavation in 1931. 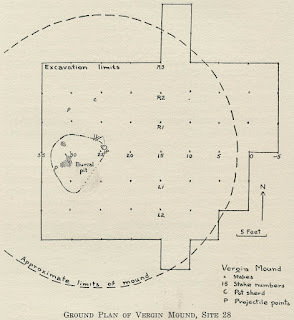 Ground plan for excavation of the Vergin Mound in Boone Township in 1931. D. The Aylesworth Mound was named after the Aylesworth family since it was situated on property owned by the family when first excavated in 1891 by George C. Gregg of Hebron. 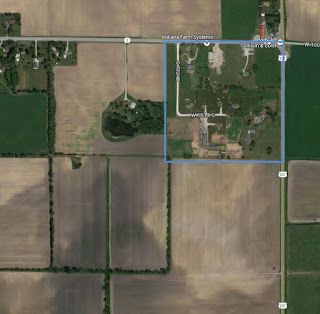 The mound is located in the northwest quarter of the southeast quarter of the southeast quarter of Section 9, Township 33 North, Range 6 West, approximately 1,300 feet north of Indiana State Road 8, 1,000 feet west of County Road 200 West, and east of the Cornell Ditch. 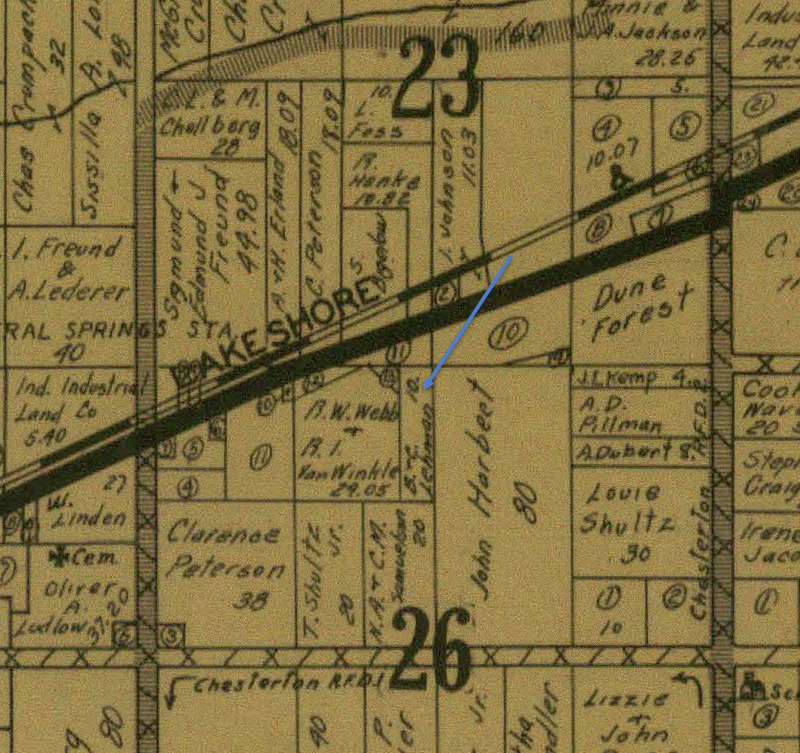 Today, the cul-de-sacs of Walter Drive and Chester Drive are located very near the location of the Aylesworth Mound. Due to agricultural practices, the mound has been completely obliterated. The diameter of the mound, when first measured, was 56 feet, and the height of the mound ranged from two to two and one-half feet. During Gregg's 1891 excavation, skeletal material was found at a depth of three feet, though no artifacts were found with the human remains. When McAllister conducted his research in Porter County in 1931, he found some flint flakes in the vicinity of the mound, but nothing more. McAllister identified this mound as Site 29. "Tradition among the oldest settlers tells of a natural sand mound which has been used as an Indian cemetery. According to John Reif white men are buried on the southern slope of this same elevation. Artifacts are sometimes unearthed while plowing.... About 100 feet north and on the line between Sections 17 and 8, skeletons and accompanying artifacts were unearthed when a cut was put through the sand ridge in building the highway." 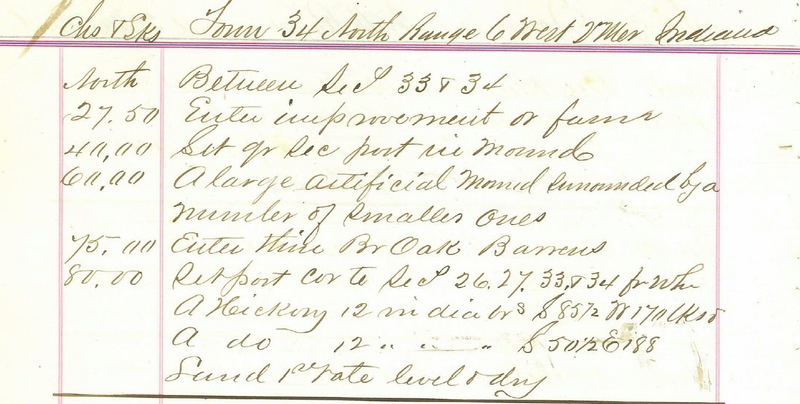 report concerning Porter County archaeology. 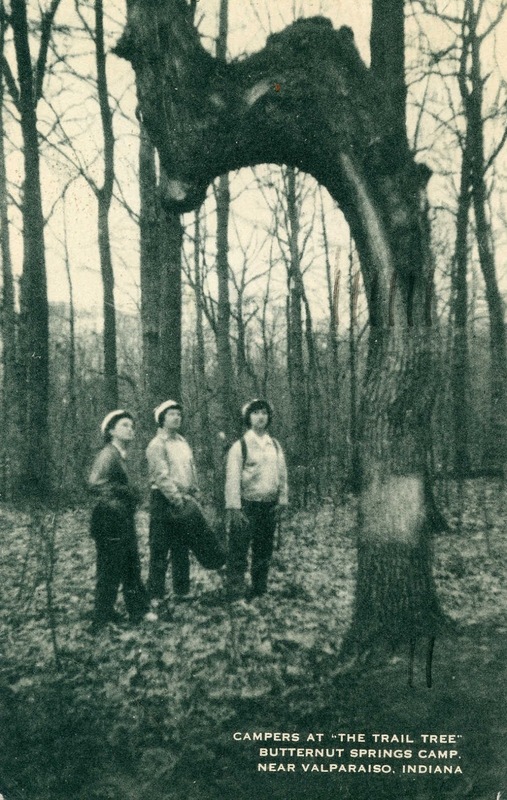 "In the early '50s [1850s] a sawmill was set up near the mouth of Sandy Hook creek in Boone township, and soon after that it was started a number of old Indians visited the neighborhood to pay their respects to the graves of some of their ancestors. 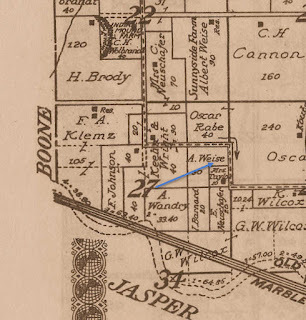 This led to the discovery of an old burying ground some seven or eight acres in extent, located in Section 21, township 33 north, range 6 west, a short distance north of the Kankakee river. After the departure of the Indian visitors, excavations were made and a number of implements, weapons, ornaments, images, etc., were found." 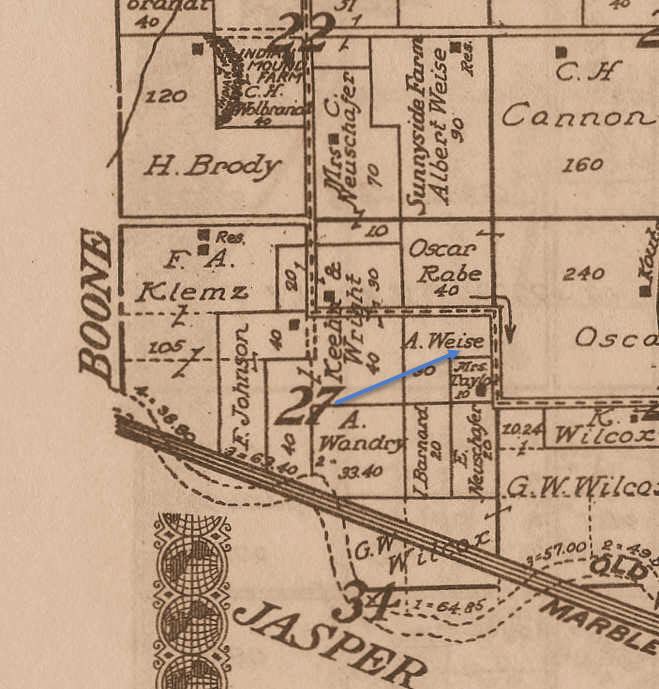 Given the description above, the burial ground was likely located in the south half of Section 21, approximately one-quarter mile north of the Kankakee River and bisected north-south by County Road 250 West. 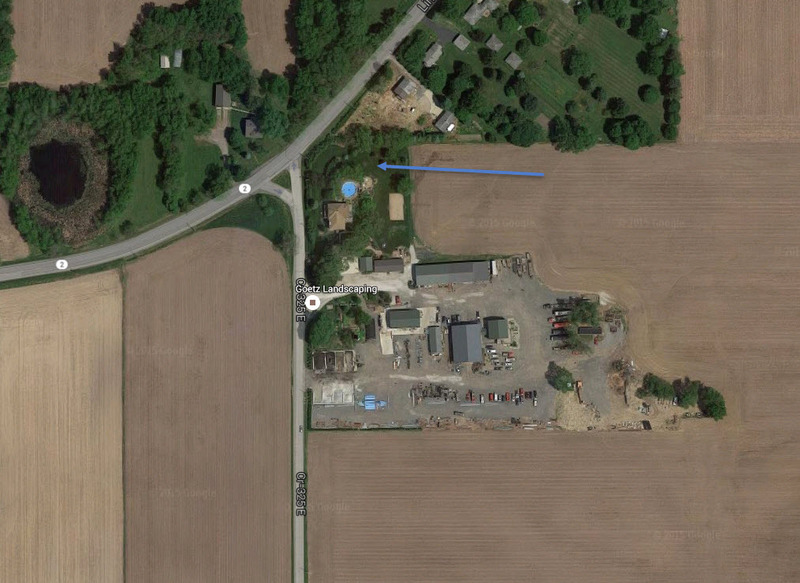 This location has long since been drained, farmed, and developed with residential housing. Sources: Lewis Publishing Company, 1912 [see p. 24]; Google Maps, 2015. McAllister notes a reported burial site immediately south of Section 21 location mentioned in Lewis Publishing Company 1912 history of Porter County; more specifically located in the southwest quarter of the northeast quarter or the northeast quarter of Section 28, Township 33 North, Range 6 West. This would place the burial ground immediately adjacent and north of the original bed of Kankakee River, which was rerouted with the dredging and creation of Marble Ditch. It appears that McAllister and his assistants spent some considerable time examining this site, identified in their report as Site 34. No evidence of Native American occupation or burial was uncovered, however, and McAllister concludes in his report that "this elevation appears to be natural" since "no flint chips, pottery, or other evidence of artificiality were found." ".... No records exist, but Mrs. Elizabeth Massey, who was an early settler, often told of counting 45 Indian graves on the highland, close to the site where our citizens established the Old Cemetery, the Union Street cemetery. That general area was the only spot in the vicinity high enough to permit a dry grave to be dug." It is speculated that this site was located in either the west half of the northwest quarter of the northeast quarter of the east half of the northeast quarter of the northwest quarter of Section 25, Township 35 North Range 6 West. The two-story tower is near the center of section 16, 35-6, exactly on the site of an old Indian graveyard, and old timers told of seeing ghostly savages haunting the place when steam shovels cut through their burial place. Given the brief description in the column, this Native American burial site may have been located at the southwest quarter of the southwest quarter of the northeast quarter of Section 16, Township 35 North, Range 6 West, along the east side of County Road 250 West (commonly known as Tower Road). I. A Native American burial ground reportedly was situated adjacent to the Cole Cemetery. 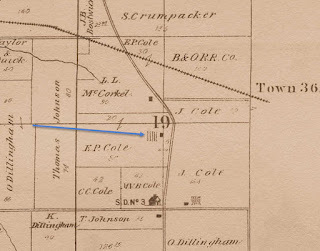 The Cole Cemetery, which no longer exists, was located in the northeast quarter of the southwest quarter of Section 19, Township 36 North, Range 5 West, lying west of Old Indiana State Road 49. The Cole Cemetery was on a hill just behind the Cole family homestead, which is presently occupied by the Liberty Bible Church parking lot. After the death of Sally (Dillingham) Cole, the Cole homestead was sold and then resold to I. M. Biggs around 1900. Section 19, Township 36 North, Range 5 West. The Biggs family requested that the graves of the Cole family be disinterred from the site, which the Cole family agreed to do since they feared that the tombstones would be removed and the graves plowed over and forever obliterated. The graves and tombstones of four Cole family members buried at the cemetery were thus removed from the site and reburied at the Adams Cemetery in Morgan Township where Sally (Dillingham) Cole's son had a family plot. J. 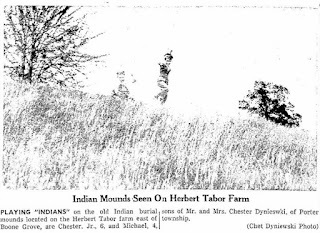 A December 22, 1971, column published in The Vidette-Messenger, suggests that a Native American burial mound existed at that time in the west half of the west half of the northwest quarter of the northeast quarter of Section 25, Township 36 North, Range 5 West, located immediately south of and adjacent to U.S. Route 6. There was a remonstrance made to protect the area when Liberty Farms Mobile Home Park intended to expand westward and encroach on the site. "At Gosset [Sic] cemetery on Salt Creek is buried another Revolutionary War veteran, Father Bataan [Henry Batton], who with his daughter came to the ill-fated City West to buy a town lot in 1837 -- and finding the townsite a failure, he took up his residence at Valparaiso. This old cemetery dates so far back in history that no one knows when the first white man was buried there. Nearby was an ancient Indian graveyard." 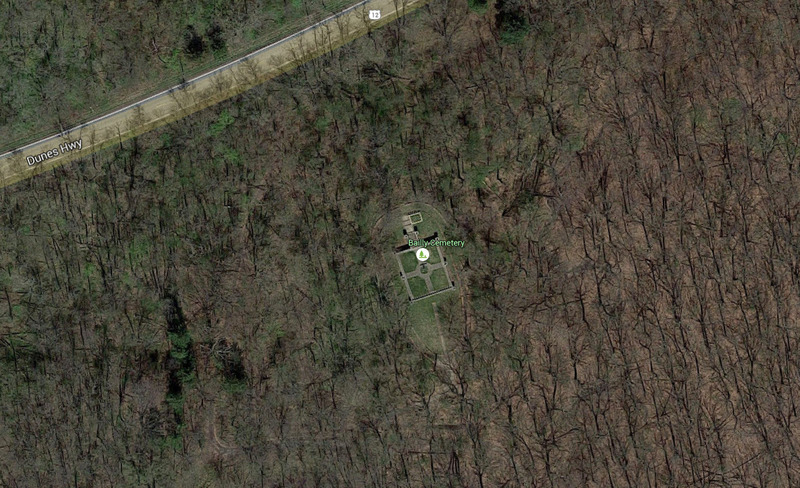 Gossett Cemetery, denoted by blue arrow, in Liberty Township. the northwest quarter of Section 21, Township 36 North, Range 6 West. 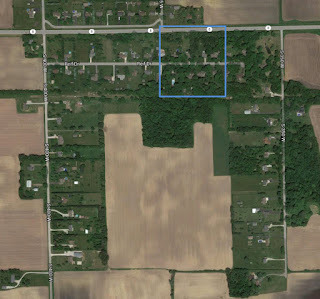 The Gossett Cemetery is located in the northwest quarter of the northwest quarter of the northwest quarter of Section 21, Township 36 North, Range 6 West, which is nearly on the boundary line between the townships of Liberty and Portage. 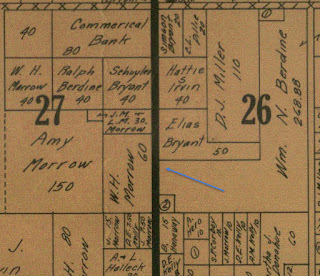 Thus, it is possible that the Native American burial ground mentioned in the column above is in Portage Township. L. A possible Native American burial site was uncovered when a skull was found at 9:45 am on January 20, 2014, by Precision Pipeline LLC while excavating along the route of the Enbridge Pipeline. The skull was located approximately 500 feet west of Meridian Road and one-quarter mile south of U.S. Route 6 (east half of the southeast quarter of Section 23, Township 36 North, Range 6 West). It was reported that preliminary research found that the skull was of pre-1940 origin. "Although there are several springs in this vicinity none is similar to the one where the Indians brought their sick to be healed. Two blocks west of the spring is a small mound which is said to be the grave of an Indian Cheif [Sic]. At one end of the grave is a tree which has a crook in it which appears to look like the hump on a camel's back and it is called the 'Camel Tree' for that reason." It is quite possible that the "Camel Tree" was purposely bent as a trail marker by Native Americans. 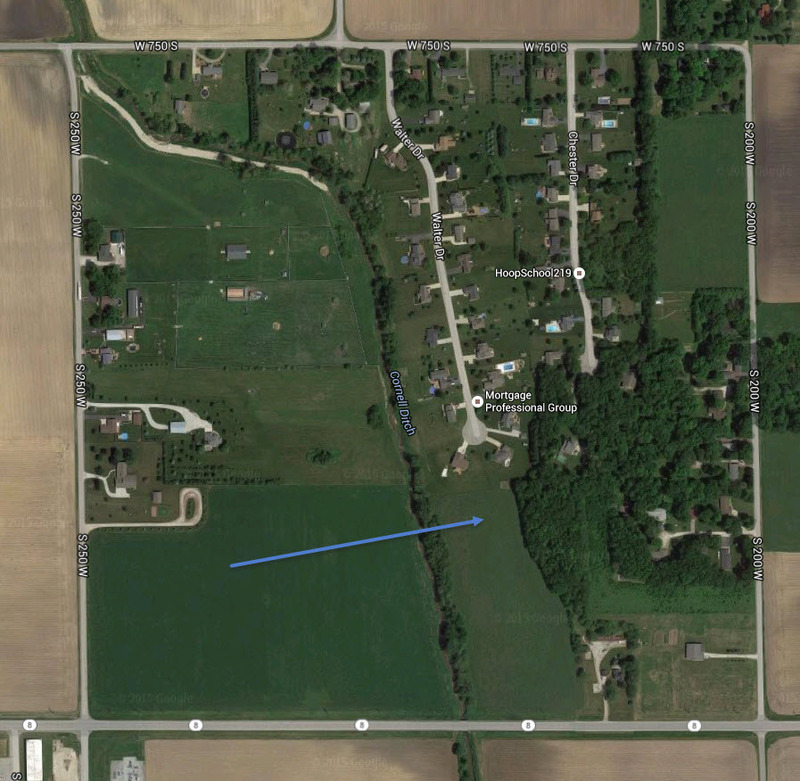 Butternut Springs, denoted by blue arrow, in Liberty Township. Section 27, Township 36 North, Range 6 West. quarter of Section 27, Township 36 North, Range 6 West. Stamp on postcard was postmarked in 1957. N. The LaCount Mounds, situated in Morgan Township, are located in the southeast quarter of the northwest quarter of the southwest quarter of Section 30, Township 34 North, Range 5 West, approximately 400 feet north of Sandy Hook Creek. The name of the mounds originates from a owner of the land on which it is located, Charles F. LaCount. southwest quarter of Section 30, Township 34 North, Range 5 West. The mounds were reported to have been about 15 feet in height, but by 1931 the height of the mound had diminished to two feet due to several prior excavations. Today, the mounds are virtually flattened. Just west of the center of the mound, at a depth of three to four feet, were found three skeletons. A leather wrapped copper celt (a hoe or ax-like tool) measuring 5.63 inches in length, a pipe, and a piece of pottery were found with the skeletal remains. "An Indian mound, on the Charles LaCount farm, in Morgan township, which has been excavated by the LaCount Brothers, has given up four skeletons of what are generally believed to be Indians. The bones of the bodies crumble upon being exposed to air, but the teeth are remarkably well preserved. The skeletons are those of big men, and tomahawks, pipes and pottery found near the bodies prove beyond a doubt that they are Indians. The state of the bones indicates that burial took place many years ago. The mound itself, is twenty feet high and more than fifty feet across. The earth composing the mound is clay texture of soil that is proof against weathering. There are three other mounds on the LaCount farm and these will be excavated by the LaCount boys." 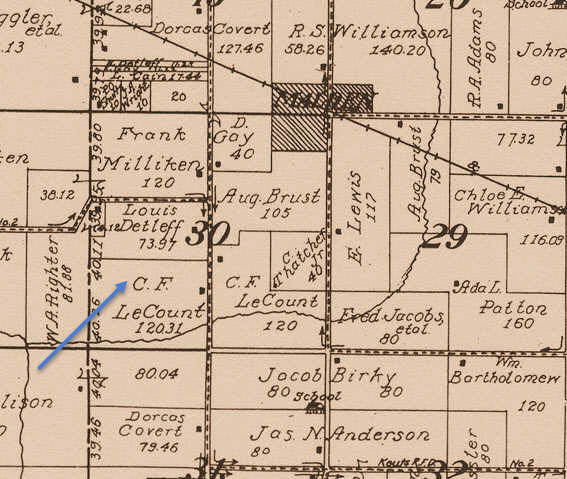 McAllister writes in his 1932 treatise on Porter County archaeology that three to five mounds existed west of the LaCount farmhouse in some timbered ground. McAllister, who identifies the area as Sites 15 and 16, indicates that all the mounds are about the same size, with the largest being 28.5 feet in diameter and two feet in height. Thus, if the historical reports concerning the LaCount Mounds are accurate, considerable excavation took place at this site. Range 5 West. McAllister identifies these mounds as Site 16. "...is an elevation which has been pointed out as a possible mound. It is on a natural rise adjacent to land that was formerly marshy and until recently was in timber. 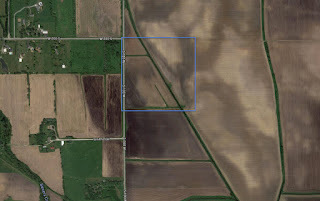 Harry Vergin, who formerly farmed the neighboring land, remembers a slight elevation and that there was a depression in the center, as if someone had been digging. At the highest elevation of the place pointed out there is a yellow sandy soil which differs from the surrounding almost black soil of the field. The area is now under cultivation and there is practically no evidence of a mound." Township. McAllister identifies this possible mound as Site 14. P. The Weise Mound is discussed in great detail in McAllister's 1932 report concerning the archaeology of Porter County. The mound was named after Albert Weise, who owned the property where the mound is located when it was scientifically examined by McAllister, who assigned the mound the identifier of Site 35. The exact location of the mound is the northeast quarter of the southeast quarter of the northeast quarter of Section 27, Township 33 North, Range 6 West. Alternatively, the site can be described as being located directly southwest of the intersection of County Road 1025 South and County Road 100 West. The immediate area surrounding the Weise Mound was commonly referred to as Indian Gardens early in Porter County history. northeast quarter of Section 27, Township 33 North, Range 6 West. Range 5 West. McAllister identifies this mound as Site 35. 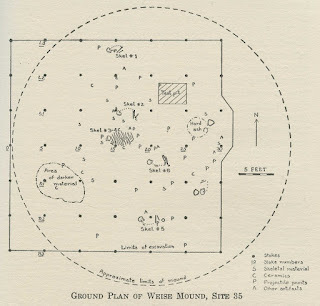 Ground plan for excavation of the Weise Mound in Pleasant Township in 1931. McAllister remarks that the Weise Mound was first plowed in 1925 and had been plowed two additional times between 1926 and 1931. An excavation of the mound is known to have taken place in 1908 by Charles Wilcox, who is reported to have unearthed six skeletons. 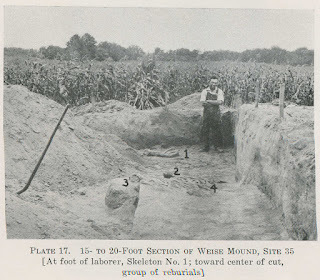 During McAllister's excavation of the Weise Mound in 1931, five more skeletons were found and a group of "reburials" were also uncovered, which may possibly have been from the Wilcox excavation 23 years earlier. 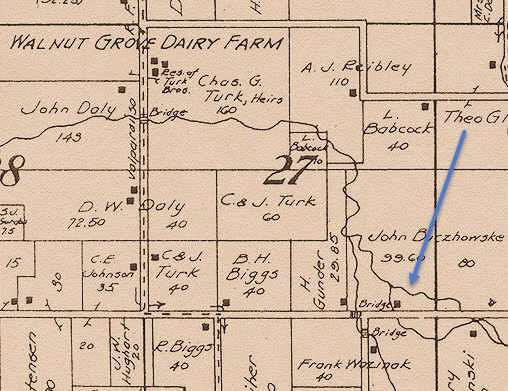 in Pleasant Township in 1931. "Several burials have been found by Jim Collier in the immediate vicinity. One, he says, was in a sitting posture." 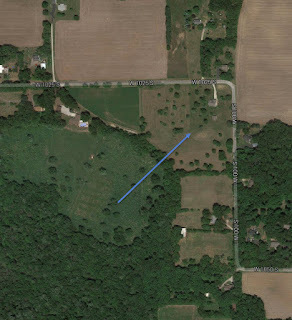 most researched site in Porter County, with excavations continuing to take place. "On Section 36, Township 36, Range 6, was what had the appearance of an Indian burying-ground. Evidences of about twenty graves were to be seen." The steam shovel at work on the B. & O. near Willow Creek, dug up the skull of a person. It had the appearance of having been buried for a long time. As no other bones of the body were found, it was thought by some that at some time in the long past a murder might have been committed and the head buried in the sand to hide the crime but none of the old residents have any recollection of such a thing, so the find remains a mystery. 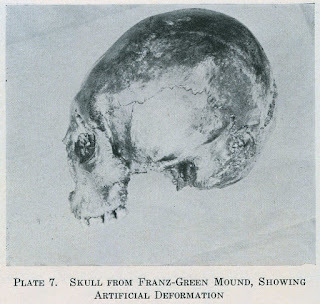 It's possible, given the lack of details and inability of local pioneers to recollect any past murder in the area, that this was the skull of Native American origin. Given the description in the news item, it is believed that the skull was uncovered in either Section 11 or 12, Township 36 North, Range 7 West, west of Crisman. 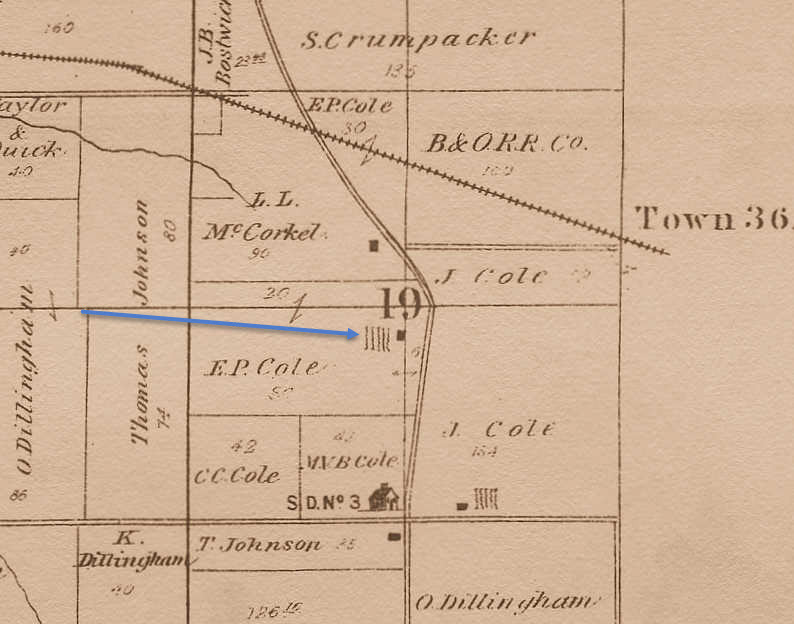 "The only mound which we have been able to locate in the northern part of the county, was in the southern edge of the village of McCool, on the eastern side of main street. It was six, or more, feet in height and some thirty in diameter. It was removed several years ago by the owner, Joseph S. Robbins, and the dirt used for filling. Harvey McCorkel, a young student of the village, watched for the archaeological finds and was rewarded with several tomahawks, skinning knives, arrowheads and pieces of flint. These were arranged in a circle and imbedded [Sic] in a layer of reddish earth which had evidently been burned. No skeleton was located, though the findings would indicate the burial place of a chief. Deeper excavation may disclose more data concerning it." The Wark Mound Complex represents a group of at least ten Native American mounds located in Sections 27, 28, 33, and 34 of Township 34 North, Range 6 West, in Porter Township, east of Boone Grove. This group of mounds is named after one of the former owners of land upon which several mounds are located, John Wark. 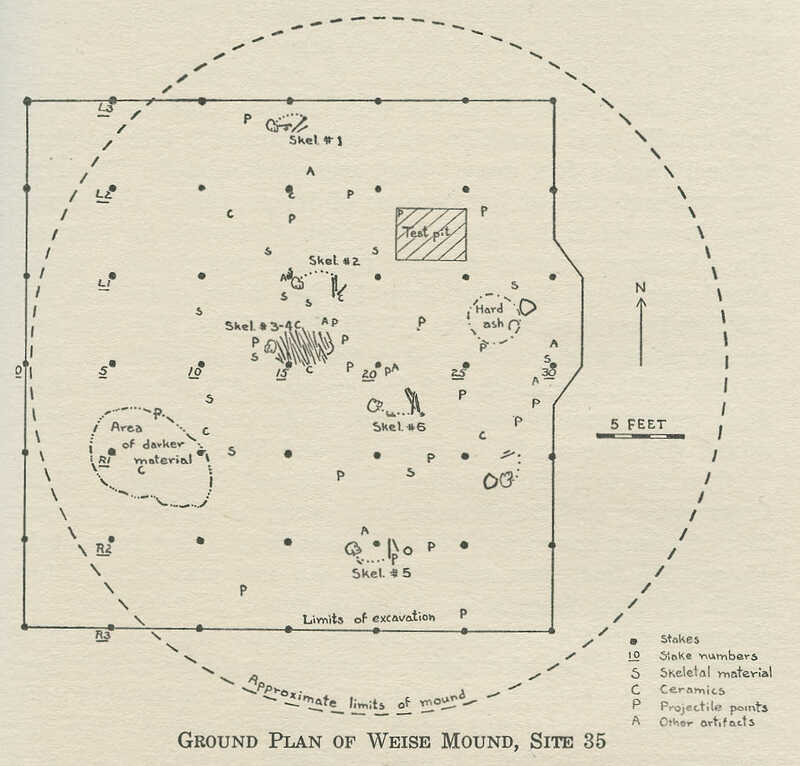 The largest mound in the complex is referred to as Wark Mound, and the complex of mounds was known to exist as early as 1834, as they are clearly noted and drawn in the Record of Field Notes, United States Land Survey. The notes regarding the survey of the north-south line between Sections 33 and 34 state that "a large artificial mound surrounded by a number of smaller ones." mound surrounded by a number of smaller ones" in present day Porter Township. 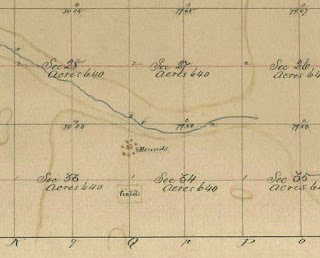 Source: Record of Field Notes, United States Land Survey, 1834. Township map for Township 34 North, Range 6 West. 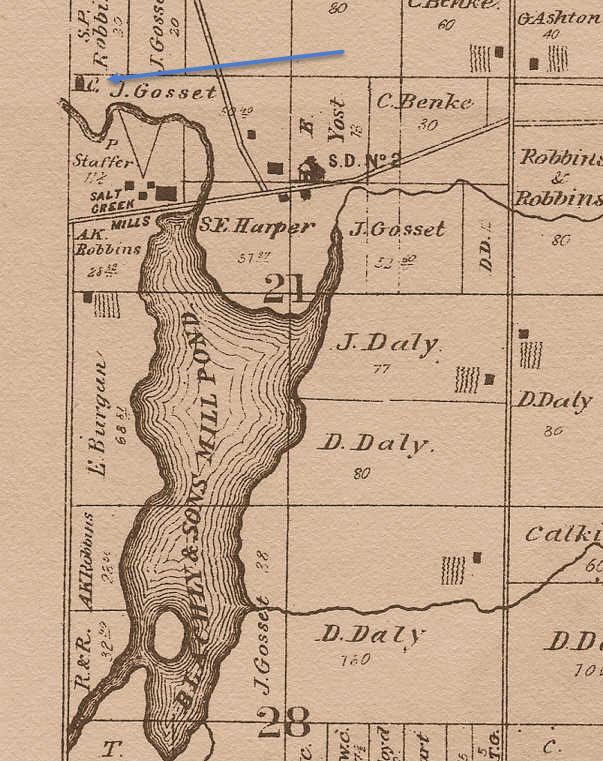 Land Survey of land now embraced by Porter County, 1834. Source: Original Township Plat Book, United States Land Survey, 1834. By 1931, many of the mounds in the Wark Mound Complex, especially those located in Section 33, were barely discernible due to previous excavations and past agricultural practices. Not all mounds yielded skeletal remains. U. The Wark Mound, identified by McAllister as Site 19, is the largest known artificially constructed mound in Porter County. This mound is located in the northeast quarter of the northeast quarter of the northeast quarter of Section 33, Township 34 North, Range 6 West. Being slightly more than 100 feet in diameter, the mound was believed to be at least 16 feet in height before excavations reduced the height to ten feet by 1931. The Wark Mound in Porter Township in 1931. 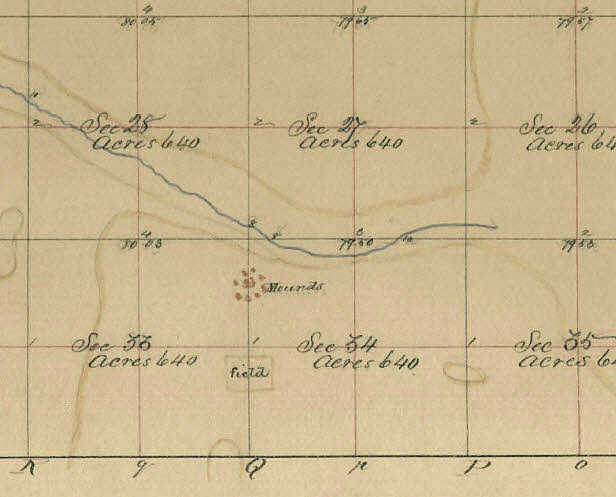 The Record of Field Notes, United States Land Survey of 1834 report that eight smaller mounds surrounded the Wark Mound, but by 1897 these nine smaller mounds were no longer visually perceptible. 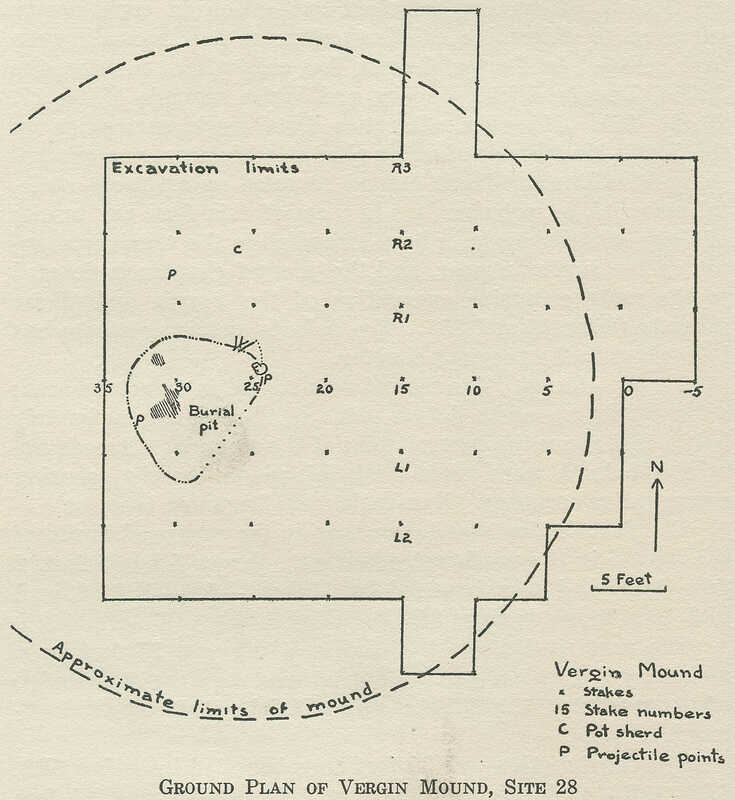 Consequently, McAllister's report shows no mounds surrounding the Wark Mound. Range 6 West. Today, the site is completely obliterated. Austin E. Upp was the first man to farm the land upon which the Wark Mound is located. Reports state that Upp indicated that the mound was much steeper and quite difficult to plow when he began farming the land. On October 6 and 7, 1897, State Geologist W. S. Blatchley excavated a ditch measuring three feet wide, 32 feet long, and 14 feet deep bisecting the Wark Mound. Near the center of the mound he discovered one very badly decayed partial skeleton; a total of 14 teeth were found and only a few bones were recovered. burial mound east of Boone Grove in Porter Township. A. E. Upp, residing in Boone Grove, has one of the smallest arrowheads in existence. It is only a half-inch long and may have been a plaything for some papoose, While pulling weeds the other day, Mr. Upp found it near the mounds that are located on his farm and that of Robert Wark, which gave up many Indian skeletons a year ago." "But the largest, most beautiful and most perfect of the entire group is one some five hundred feet southwest of the northeast corner of section thirty-three. It is in an open field and cultivated entirely over. It is a perfect sugar loaf, being about twelve feet in height with basal axes being two hundred (east and west) and one hundred twenty (north and south) feet. It is a marvelous specimen of prehistoric architecture, but will soon be ruined by the cultivation of the field, unless some step is taken to preserve it. Some plan should be worked out, whereby these relics of bygone days may be preserved by future generations." V. The Allman Mound is one of the mounds within the Wark Mound Complex; it is located in the approximate center of the south half of the northeast quarter of the northwest quarter of Section 34, Township 34 North, Range 6 West. 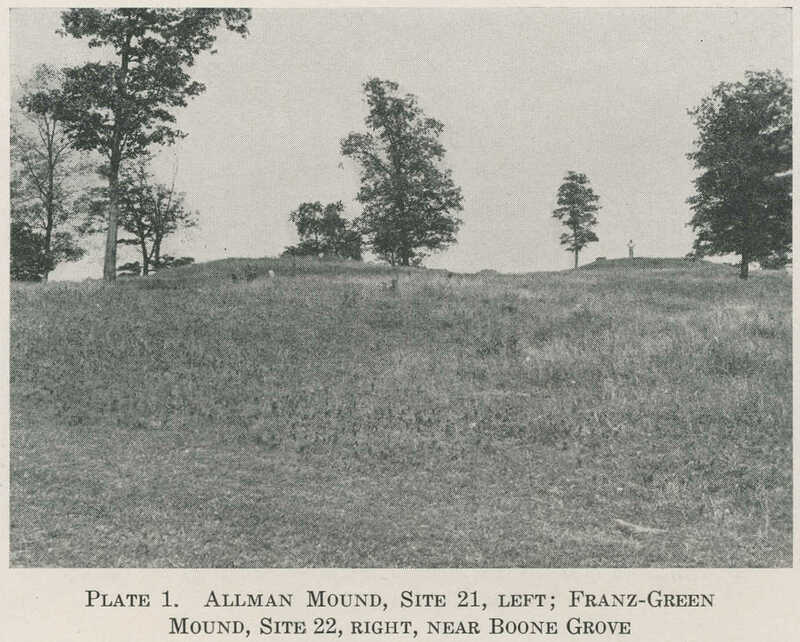 In 1931, the diameter of the Allman Mound was measured as being 45 feet and the height was calculated to be 4.1 feet. State Geologist Willis Stanley Blatchley reported that in October of 1897, Charles H. Wood, Superintendent of the Valparaiso Schools, excavated the Allman Mound. Blatchley stated that wood found "no skeletons or implements of any kind," but that "charcoal and ashes were quite common." Mound is a mound located within the Wark Mound Complex. In 1928, J. C. Allman excavated at the center of the mound to a depth of three feet. Allman reportedly unearthed several skeletal remains, reporting that most of the bones were in an excellent state of preservation. 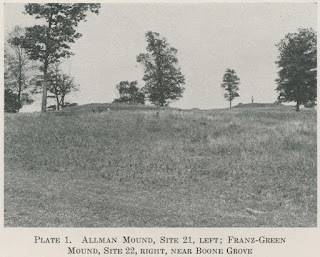 McAllister, who identified the Allman Mound as Site 21, provides a transcription of the report that J. C. Allman prepared concerning his excavation of this mound. W. The Franz-Green Mound is another mound located within the Wark Mound Complex. This mound is located in the southeast quarter of the northeast quarter of the northwest quarter of Section 34, Township 34 North, Range 6 West, and identified by McAllister as Site 22. State Geologist Willis Stanley Blatchley reported in 1897 that the Franz-Green Mound "is 210 feet in circumference and its crest is 10 feet above the surrounding level." 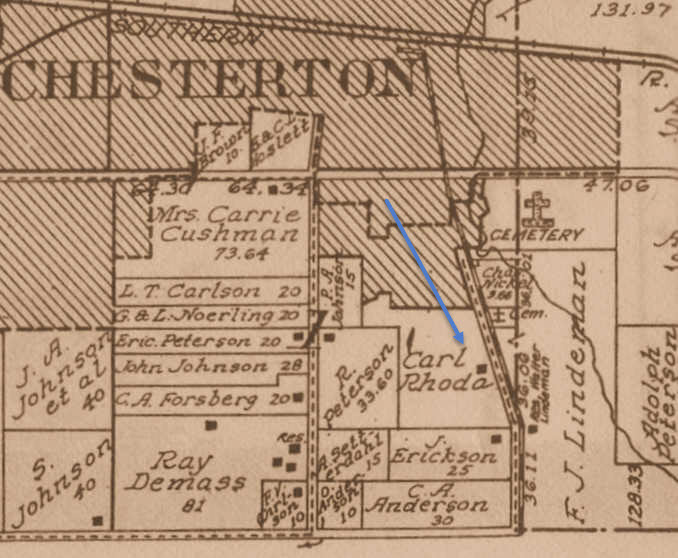 Blatchley also indicates that Charles H. Wood, Superintendent of the Valparaiso Schools, excavated at the Franz-Green Mound, but no information concerning Wood's discoveries was obtained. 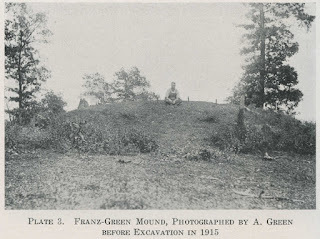 In 1915, the Franz-Green Mound was excavated by Harvey Franz and Amos Green, from which the mound derives its name. 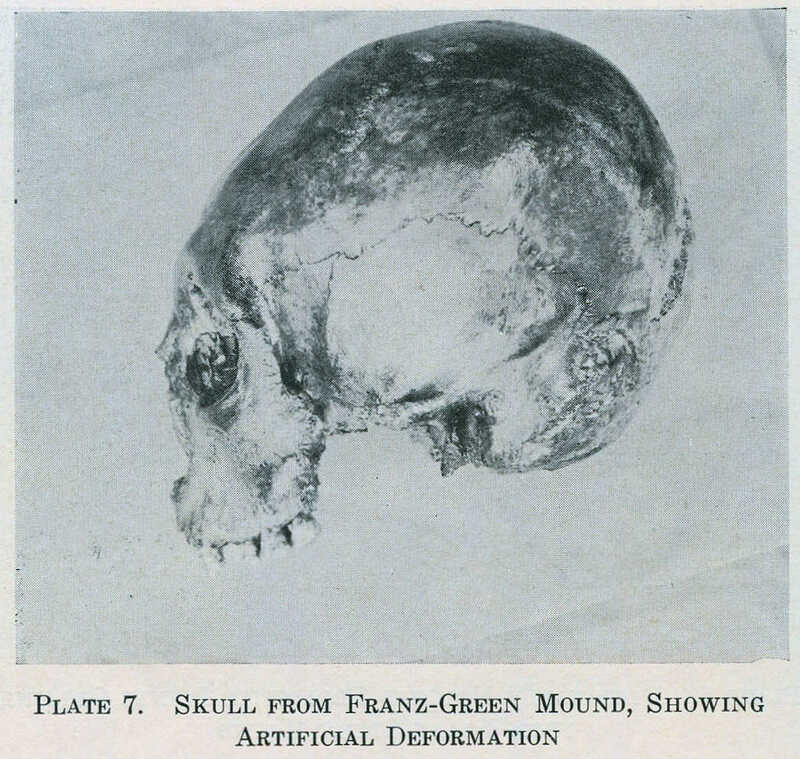 The Franz-Green excavation resulted in the discovery of at least 17 burials, three of which were children. Numerous artifacts were also found with the burials. 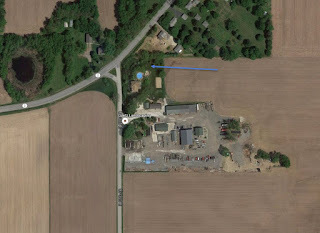 Interestingly, much of the soil removed from the Franz-Green Mound was taken away to be used as fill for the low area around the barn yard of the William Rampke property. mound located within the Wark Mound Complex. X. Two smaller mounds, known as Site 23 in J. Gilbert McAllister's archaeological report for Porter County, exist on the section line between Sections 33 and 34, Township 34 North, Range 6 West. State Geologist Willis Stanley Blatchley reported that one of these mounds "is 175 feet in circumference and six feet high, the other is 75 feet in circumference and four feet in height." Blatchley and Charles H. Wood, Superintendent of the Valparaiso Schools, excavated at Site 23 in 1897, though results of their investigation is unknown. In the fall of 1930, J. C. Allman and some boy scouts excavated the larger of the two mounds located at Site 23 and at a depth of four feet discovered skeletal material. The human remains were reportedly not disturbed and the earth was replaced over them. "Jake Marks, the west side barber, who maintains a collection of curios in his window, has an addition to it today in the form of upper and lower jawbones of an Indian, unearthed near Boone Grove, and provided for the display by Charles Cobb." Z. The Smith Mound is located northeast of Boone Grove, more specifically in the center of the south half of the southeast quarter of the southeast quarter of Section 28, Township 34 North, Range 6 West. In 1931, McAllister spent two days excavating at this site, denoted as Site 17, and found little evidence of Native American burials or occupation. Willis Stanley Blatchley, State Geologist, also excavated this site in 1897, which he identified as mound Number 7. Walter Smith, for whom the mound is named, also excavated at this site in 1930. It is reported that Smith dug a trench four feet by six feet in dimension and five feet deep in the approximated center of the Smith Mound, but he found no skeletal material or artifacts. McAllister speculates that the Smith Mound may be a natural tumulus rather than an artificially constructed mound. AA. Approximately 30 feet southeast of the Smith Mound, McAllister identifies another mound as Site 18. McAllister states that "The place was pointed out by a number of local farmers as the site of a mound which was graded down in making a road.... Nothing now remains to denote its former presence." The mound was located in the far extreme southeast corner of Section 28, Township 34 North, Range 6 West. The mound site is located about one-half mile southeast of Merriman Cemetery, and no road traverses the site today. 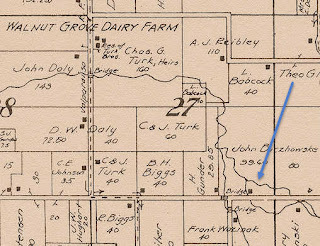 Early county maps, such as the 1928 county plat map, show that a dirt road once passed through the site, thus supporting the farmers' claims. State Geologist Blatchley explored this site in 1897, identifying it in his report as mound Number 6. BB. 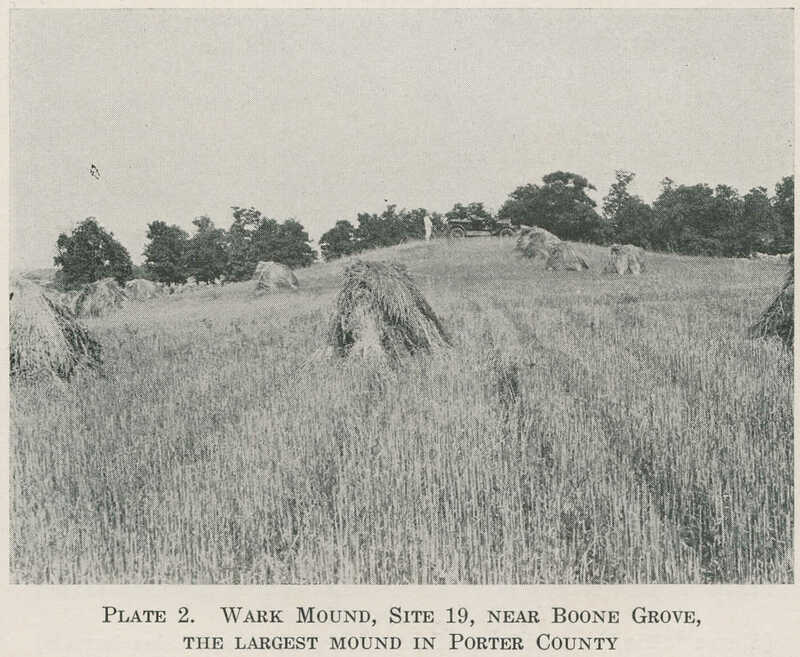 The Douglas-Hiatt Mound is identified in McAllister's report concerning the archaeology of Porter County as Site 20. 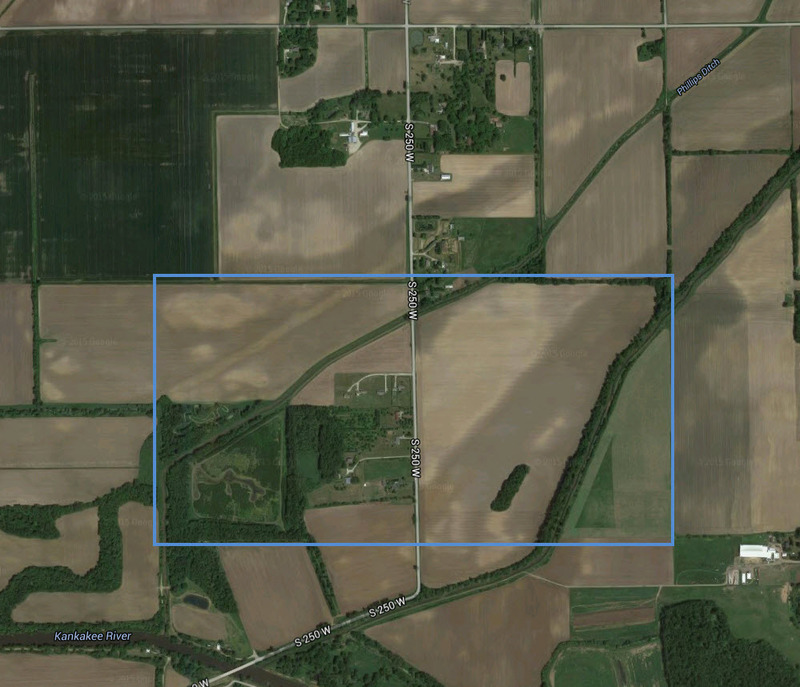 It is slightly more than one-quarter mile east-southeast of the Wark Mound. McAllister places the exact location of this mound as the southwest quarter of the northeast quarter of the northwest quarter of Section 34, Township 34 North, Range 6 West. State Geologist W. S. Blatchley was the first to publish the existence of the Douglas-Hiatt Mound, stating that it was 180 feet in circumference, four feet high, and had a "black oak 5.7 feet in girth growing from its side." The mound was named after L. E. Douglas and Albert Hiatt, who excavated the mound in 1928. Douglas and Hiatt dug a pit in the center of the mound and found a depression in the floor of the mound where, presumably, burials had been placed. Several feet from the center of the mound, at a depth of five feet, artifacts were found that were associated with Native American burials. This included a platform pipe with a curved base. McAllister reports that the pipe broke after being retrieved from the mound and that Douglas and Hiatt lost the pieces of it. McAllister also excavated at the site. He found numerous of flint chips and pieces of charcoal, but "not a single artifact or pot sherd was found." CC. McAllister notes that mound exists south-southeast of the Wark Mound, which he identified as Site 25. The site is specifically located in the northeast quarter of the southeast quarter of the northeast quarter of Section 33, Township 34 North, Range 6 West. 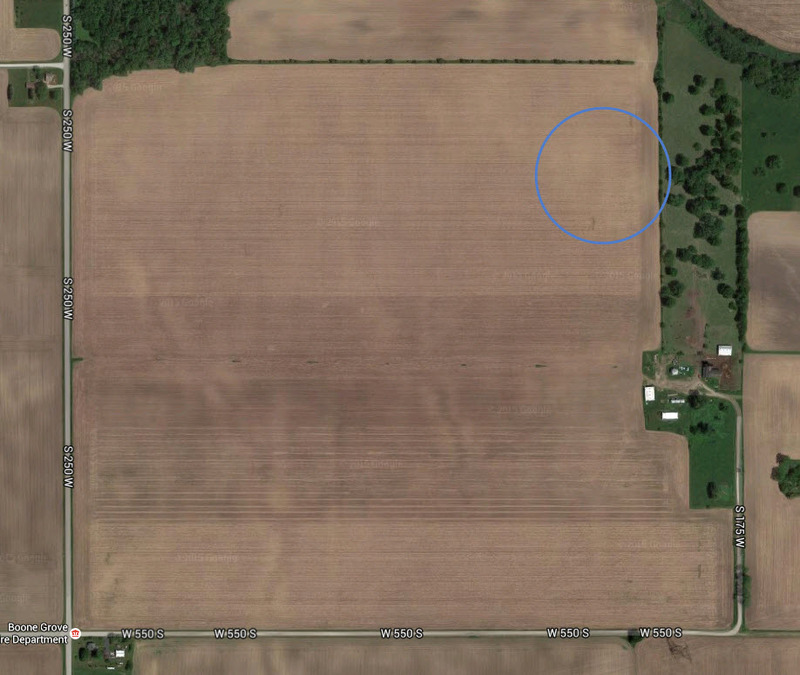 It is possible that this mound is one of the mounds shown south of the Wark Mound in the 1834 United State Land Survey plat of Porter Township. In 1931, the mound was measured to be 60 feet in diameter and about two feet high. McAllister noted during his examination of the site that the north side of the mound had been slightly graded down. Flint flakes and charcoal were found in a test pit dug at the mound site, but no pot sherds were discovered. McAllister noted that he dug to a depth of three feet and 11 inches, but did not reach the "undisturbed base" of this mound. This mound has been completely obliterated and leveled. DD. The Pike Mound is located in the center of the southeast quarter of the northeast quarter of Section 33, Township 34 North, Range 6 West, or approximately one-quarter mile south-southeast of the Wark Mound. 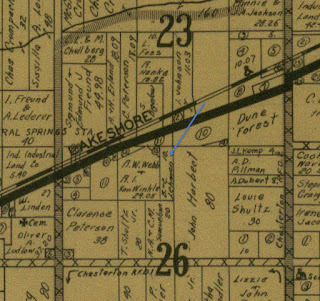 J. Gilbert McAllister identified the Pike Mound as Site 26 in his archaeology report of Porter County. He estimated the diameter of the mound to be 50 feet and the height to be 1.5 feet. A "few flint chips and small amount of charcoal" were found when McAllister and his team dug a shallow trench into the mound. The site was completely leveled by agricultural practices and no trace of the mound is in evidence today. EE. About 100 feet directly west of the Pike Mound, McAllister states that another small mound could be found. He estimated the diameter of the mound to be 70 feet and the height at 1.5 feet. By 1931, plowing had completely obliterated this mound. "A village of about one hundred or more Pottawatomie Indians was situated near the present site of Prattville. Their burying-ground was located on what is now Harmond Beach's orchard." An inspection of the 1876 plat map for Washington Township published by A. G. Hardesty shows Harmond Beach's orchard, and thus the Native American burial ground. The burial ground is located in the northwest quarter of the northeast quarter of the southwest quarter of Section 21, Township 35 North, Range 5 West. No evidence of the burial ground exists today. of the southwest quarter of Section 21, Township 35 North, Range 5 West. 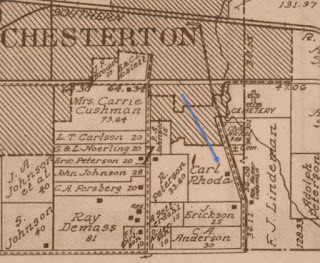 McAllister, who denotes the burial ground as Site 13 in his report on the archaeology of Porter County, remarked that "C. [Clara] Cain's orchard is said to be located on the former burying ground." GG. 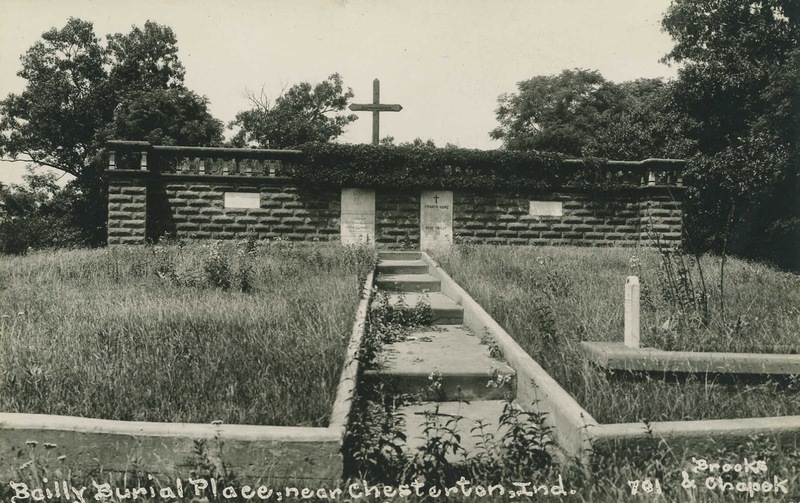 The Bailly Cemetery is located approximately three-quarters of a mile north of the Joseph Bailly Homestead in Westchester Township, at the base of a sand ridge in the center of the northeast quarter of Section 27, Township 37 North, Range 6 West. The cemetery is the oldest white burial ground in Porter County. It has been recorded that Joseph Bailly buried his son, Robert "Napoleon" Bailly, here in 1827. It has also been recorded that Native Americans first used the site for the burial of their dead. Though skeletons have been uncovered at the cemetery site on numerous occasions, they have always been reburied without a determination of their race. Hence, it has not been conclusively determined whether the Bailly Cemetery was originally a Native American burial ground prior to it use by the Bailly family. "It was found there were a large number of Indians buried outside the regular cemetery [Bailly Cemetery]. The road engineers at that time appeased the objectors to relocating the highway." The highway mentioned in the article is U.S. Route 12, then more commonly known as the Dunes Highway, which passes just north of Bailly Cemetery. northeast quarter of Section 27, Township 37 North, Range 6 West. site for the same purpose. prior to the Bailly family's use of the site for the same purpose. HH. A Native American burial ground located just to the west of the now nonexistent village of City West in the southeast quarter of the southeast quarter of Section 14, Township 37 North, Rage 6 West. 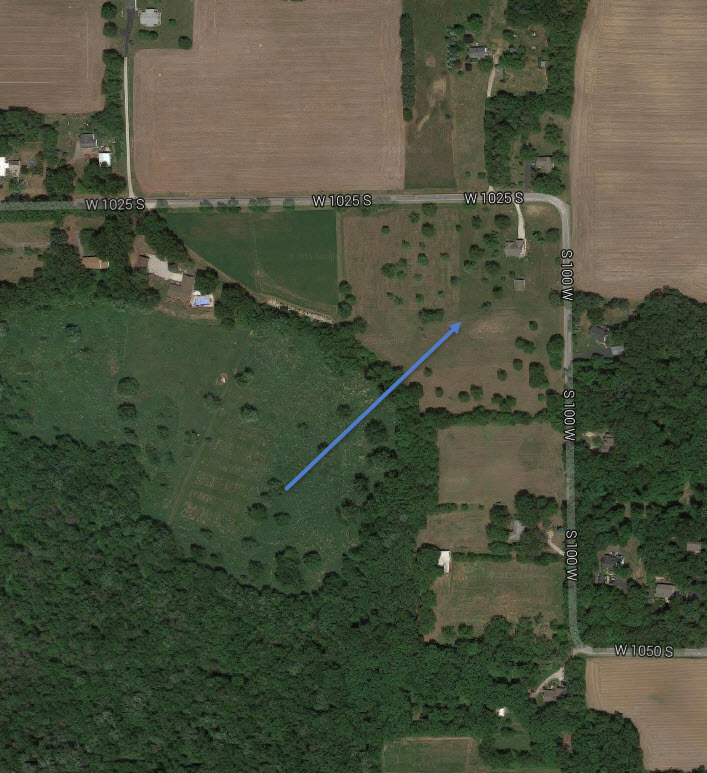 As Waverly Road approaches Lake Michigan, there is ninety degree westward turn in the road onto Roskin Road; the burial ground is located immediately southwest of this turn on wooded property and the mound is clearly evident. 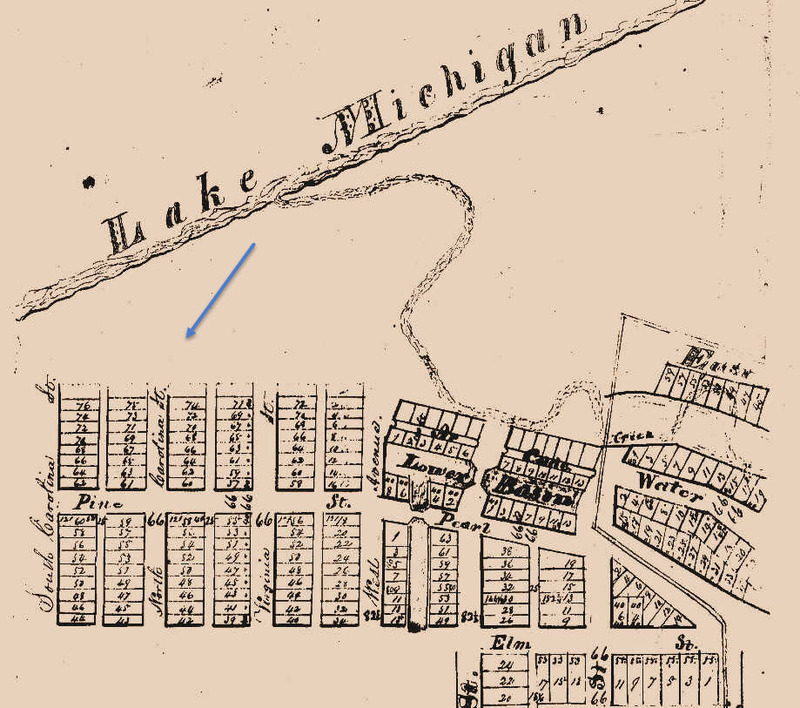 City West was laid out along the southeasterly shore of Lake Michigan at, or just south of, the mouth of Fort Creek. The pavilion at the Indiana Dunes State Park is located slightly north of where the village was located. City West competed with Michigan City for federal funds to be used for the construction of a port, but did not gain the necessary support from Congress and slowly became depopulated. 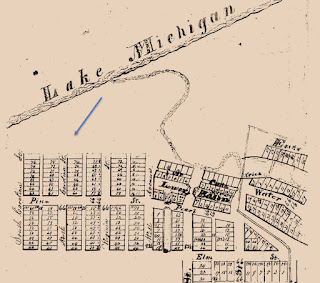 All of the structures in City West were destroyed by a lightening-ignited wildfire in 1854.
would be located immediately to the right of the blue arrow. "On a sand knoll, between the village and the lake, on the bank of a creek, there was an Indian burial ground of some size, the marks or inscriptions on the head-boards seeming to have been painted with Indian puccoon root. Here the villagers did not bury; this sacred spot they did not disturb. Near this, in the summer and fall, some Indian encampments were held; the Indians being quiet, peaceable hunting parties, one party at least having come down Lake Michigan from Green Bay, if the information imparted to the villagers was correct." Ball recalls a visit he had with Sarah J. (Beck) Stonex, daughter of Jacob Beck, in 1899, in which Sarah mentioned that she attended a Native American burial at City West when she was a young girl. Her detailed description led Ball to conclude that Sarah has attended the same Native American burial at City West that Ball recalled as a young boy. 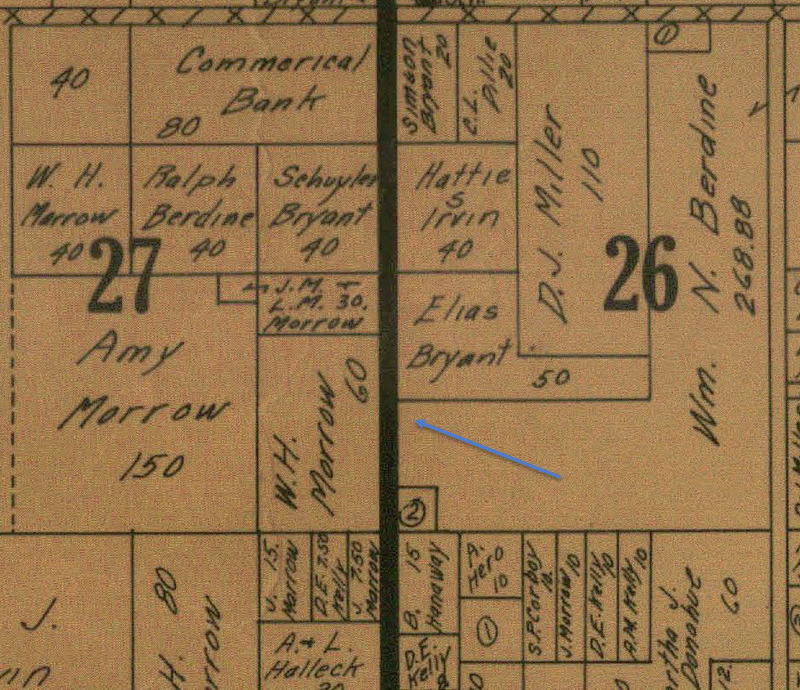 At that time, the Beck family was living in nearby Waverly, located between Baillytown and City West. Ball states how ironic it is that he should meet with another witness to this Native American burial 62 years later. He writes that "It surely made a durable impression on the memory of each. Those two early towns of the county of Porter [i.e., City West and Waverly] died young, as infants die; but the recollections concerning each live, as Christians believe that infant spirits live." Theodore Stephens, while hunting along the lake beach a few days ago, ran on to the grave of four human beings. The grave was in the first sand hill from the lake, and his notice was drawn to it by seeing a bone sticking out of the sand. Two of the bones he brought to Chesterton, and placed them on exhibition in the store of his brother, John Stephens. One of these bones is that of the left hip of a human. In it is sticking an arrow, indicating that death was caused by this missile. The other bone is from the neck, and also has an arrow lodged in it. The probabilities are that the four persons were killed in battle hundreds of years ago and that the victims were Indians. The find has attracted considerable attention here, especially in medical circles. All of the bones are in a splendid state of preservation, being kept so by their grave of sand. It is unknown what happened with these remains with regard to their disposition after Stephens' discovery. Frances R. Howe, the granddaughter of Joseph Bailly, writes an extensive and somewhat romanticized description of City West and, in particular, this Native American burial ground in the October 7, 1909, issue of The Chesterton Tribune. "Old City West, an Indian barricade at the time this country was first known to the whites, and now used as a summer resort by many, is the oldest point in this county entitled to the name of a town. Mr. Joseph C. Morgan was at an Indian burial at this place in 1838. It was the funeral of a squaw, wife of the principal chief. The ceremonies consisted of speaking, singing, dancing and a sacred feast of well-baked venison." "...at a place known as 'grave-yard' blow-out, a number of people have found skeletal material, including vertebra with arrow embedded in the bone." A scalping knife from the old Indian cemetery, adjoining the eastern part of the Jens Jensen Blowout, in which the Dunes Pageant was held at Waverly Beach, was dug up by the writer [George A. Brennan] several years ago. Upon digging it out of the sand, part of the bone handle fell to dust, showing its extreme age. The blade is badly rusted. "According to W. Layhn [William LaHayn] and A. J. Bouser [Arthur J. Bowser] this mound was formerly six feet high and 80 feet in diameter. It is now little more than 1.5 feet high, though still retaining much of its symmetry. It has been dug into a number of times, skeletal material and many relics being found. The mound has been farmed over and is now planted in alfalfa. Only flint chips were found at the time of the present survey .... Mr. Bouser is of the opinion that there were formerly more mounds in the vicinity, but none are noticeable now." 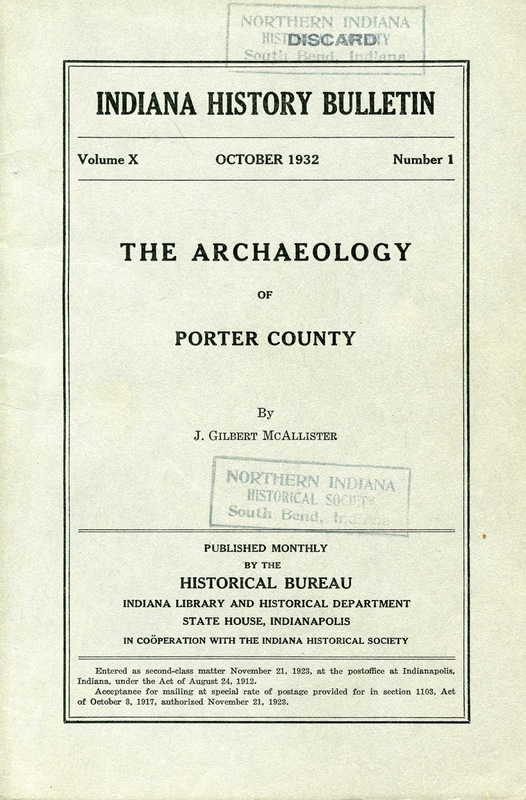 McAllister's 1932 report concerning the archaeology of Porter County. JJ. 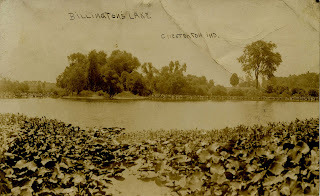 A Native American burial mound was stood between Morgan Lake and Billington Lake on the section line between Sections 5 and 6, Township 36 North, Range 5 West. Today, the mound has been completely obliterated and Sand Creek Drive traverses the site. The mound is thought to have stood about one to two hundred feet north of the north parking lot at Sand Creek Country Club. east of a former Native American burial mound, now obliterated . "It was reported by Ed Morgan that there were formerly three mounds on his father's farm. He estimates that they were about 12 feet in diameter and 2 feet high. They were excavated by the Morgans in 1893, but only skeletal material was found....Two slight elevations indicates where they stood. The soil is a sandy loam. Burned stone and flint flakes were found on the surface. Large oak trees grow on and near the site." KK. In 1922, when Wagner Road (County Road 50 West) was being constructed to connect with the Dunes Highway (U.S. Route 12) north of the Town of Porter, seven complete skeletons were said to have been removed, though no artifacts were reported to be found with the skeletal remains. These Native American burials were found immediately west of Wagner Road and south of the Dunes Highway, or more specifically in the northeast quarter of the northeast quarter of the northwest quarter of Section 26, Township 37 North, Range 6 West. 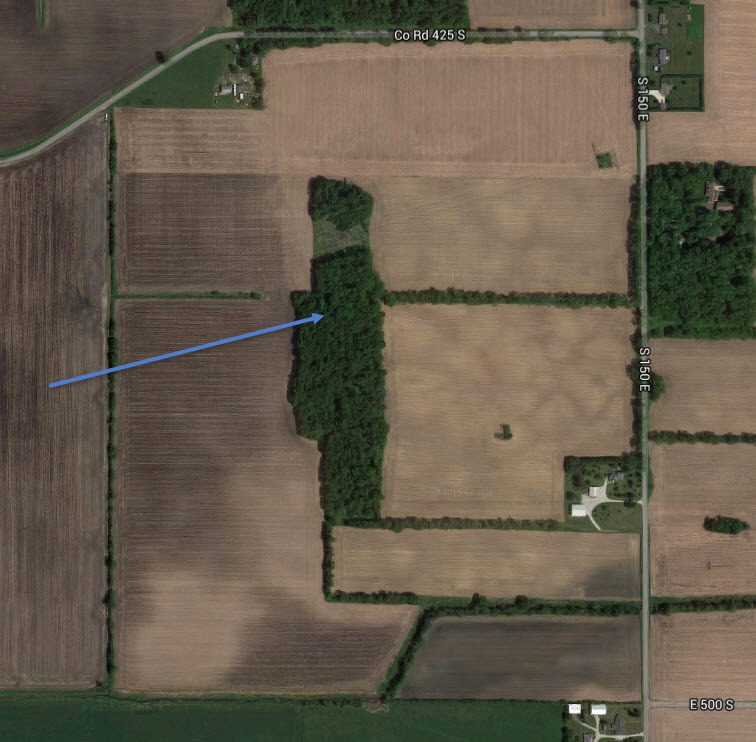 J. Gilbert McAllister identifies this location as Site 4 in his report of the archaeology of Porter County. The land on which the skeletal remains were found was, at the time of the discovery, owned by Benjamin and Clara Lehman. Highway in Section 26 of Westchester Township. LL. 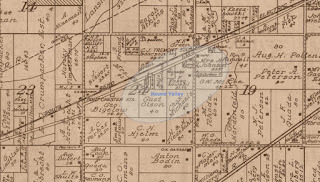 The relatively large area located immediately south and east of the former village of Tremont was once commonly referred to by locals as Mound Valley; J. Gilbert McAllister identifies this as Site 3 in his archaeology report of Porter County. Mr. Wheeler, who was born in the old Wheeler house -- now Carlson's -- on the border of this Mound Valley sixty-six years ago, and Mr. M. Green, who played on them fifty-five years ago, both say at that time there were nearly one hundred mounds in this little valley, and this is confirmed by other old settlers. These mounds ranged from twenty to fifty feet across and were from six to ten feet high. Most of these mounds were round, but some were elliptical, and from ten to forty feet long. The old settlers called these mounds, 'Indian graves.' The valley would be flooded and the water would freeze in winter; and Mr. Green said that in skating, the mounds, all of which had trees on them, made capital resting places. Much of the Mound Valley was then covered with trees. Green, when a boy, wished to see what was in the mounds, and excavated one. He found part of a skeleton, the skull apparently pointed toward the center; this crumbled into dust upon exposure to the air. A number of stone arrowheads, knives, hammers and pieces of pottery were obtained; also the remains of a long steel knife with bone handle were found. When he drew it out, the blade fell entirely into rust, and nearly all of the bone handle likewise crumbled. This looks like a later burial. Much of the soil of the mounds was reddish. In the course of time many of these mounds were dug into by people and the contents appropriated. The mounds were leveled by the plow as the space was needed for farming, and the contents scattered. Most of them had all kinds of stone relics. Few steel knives were found. 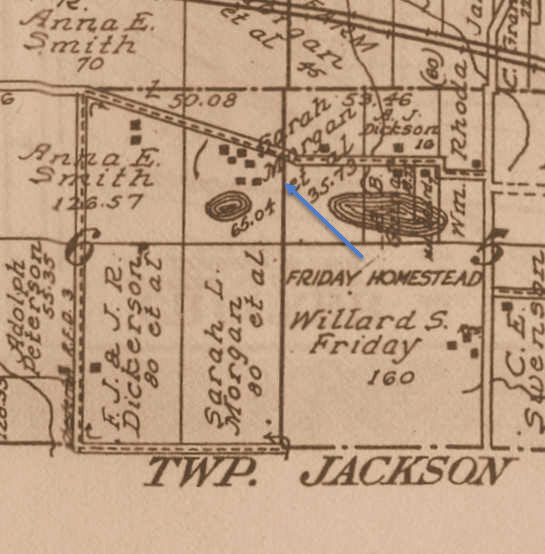 In the spring of 1917, Mrs. Brennan, Mr. Green and myself visited Mr. Koskowski, the owner of that part of Mound Valley west of the Valparaiso Road, and inspected the sites of various mounds, especially the large one about forty feet across. We noticed that the sandy ground there was more reddish than the surrounding soil. No artifacts or relics were found in the soil, as they had been removed long before. Remains on Carlson's farm were also inspected." "Several of them were examined and found to be natural. It is possible that some of these may have been used for burial purposes, though the usual practice of the Indian was to bury on higher and drier elevations." located in Section 24 of Westchester Township. Do not disturb archaeological sites! 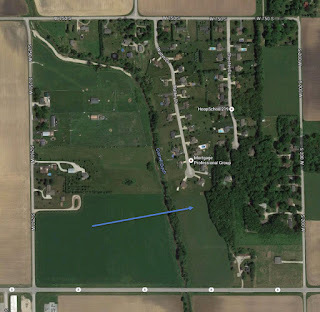 This article was written using publicly available documents and with the intent of developing an appreciation among residents for historical locations throughout Porter County as they relate to Native Americans. Note that all archaeological and and burial sites in Indiana are protected by law; excavation for artifacts dating prior to December 31, 1870, must be done in accordance with Indiana Code 14-21-1. An artifact is defined by Indiana law as (1) "a feature that is nonportable evidence of past human behavior or activity found on or in the ground, including structural remains, and formed before December 31, 1870" or (2) an "object made, modified, or used before December 31, 1870." According to Indiana law, "A person who recklessly, knowingly, or intentional violates this section [IC 14-21-1] commits the following: (1) A Class A misdemeanor, if the violation does not involve disturbing human remains. (2) A Class D felony, if the violation involves disturbing human remains." In Indiana, a Class A misdemeanor is punishable by one year in jail and a fine of up to $5,000, while a Class D felony is punishable by a minimum of six months in jail and a maximum of three years in prison and a fine of up to $10,000. amount of information discussed in this post was gathered from McAllister's book. "...a thorough scientific study of these prehistoric remains is imperative because of the numerous careless attempts that have been made to obtain material from them. Most of the smaller mounds have been penetrated by collectors, college students and boy scouts so that their contents face ruination." Ball, Timothy H. 1900. 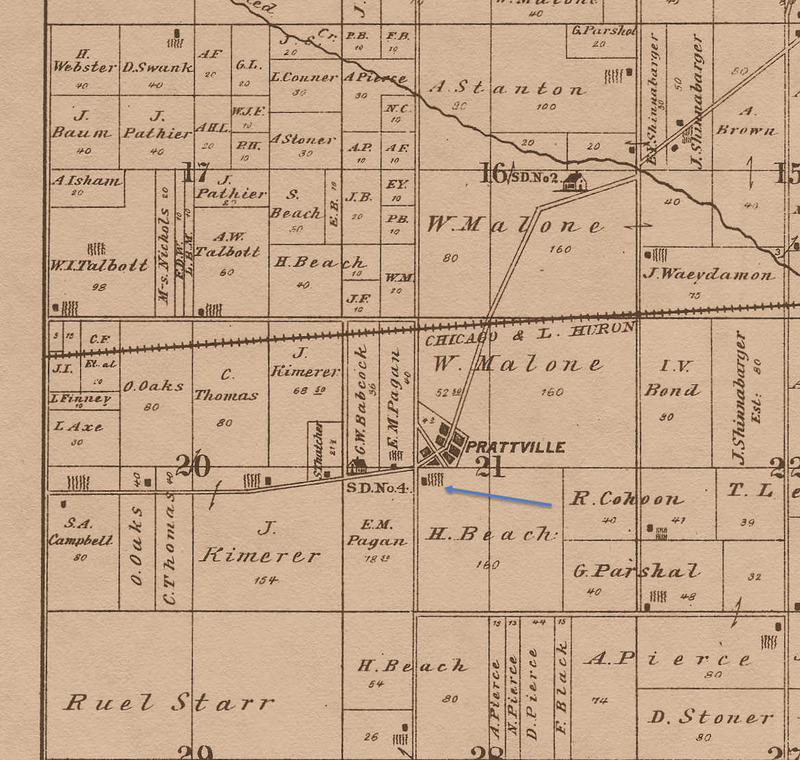 Northwestern Indiana From 1800 to 1900: A View of Our Region Through the Nineteenth Century. Chicago, Illinois: Donohue & Henneberry. 570 p. [see pp. 63, 65-66, 314-315, 320-321]. Bringelson, Dawn, and Jay T. Sturdevant. 2007. An Archaeological Overview and Assessment of Indiana Dunes National Lakeshore, Indiana. Technical Report No. 7. Lincoln, Nebraska: US Department of the Interior, National Park Service, Midwest Archaeological Center. 160 p.
Clemenson, A. Berle, Kenneth W. Bennett, and Catherine H. Blee. 1976. Historic Structure Report, Bailly Cemetery: Historical, Architectural, and Archaeological Data, Indiana Dunes National Lakeshore, Indiana. United States Department of the Interior, National Park Service, Historic Preservation Division. Denver, Colorado: United States Department of the Interior. 85 p.
Communication with J. Timothy Cole of Chesterton, Indiana. Danowski, S.C. 1936. Burial Ground at "Graveyard" Blowout and "LaPetite Fort." In Indiana Writers' Program, Works Project Administration, Porter County, Indiana. Valparaiso, Indiana: Indiana Writers' Program. 1,193 p. [see p. 693]. Field Notes North of the Base Line and West of the 2d Meridian, Indiana, 22:447. Located at Indiana State Archives, Indianapolis, Indiana. George A. Ogle & Company. 1921. 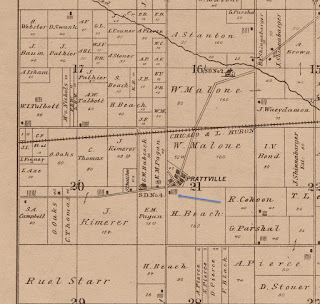 Standard Atlas of Porter County, Indiana: Including a Plat Book of the Villages, Cities and Townships of the County. Chicago, Illinois: George A. Ogle & Company. 61 p.
Mangold, William L. 2009. The Middle Woodland Occupations of the Kankakee River Valley and Beyond: The Goodall Tradition Revisited and Reinterpreted. Ph.D. Dissertation. Bloomington, Indiana: Indiana University. 256 p.
McAllister, J. Gilbert. 1932. 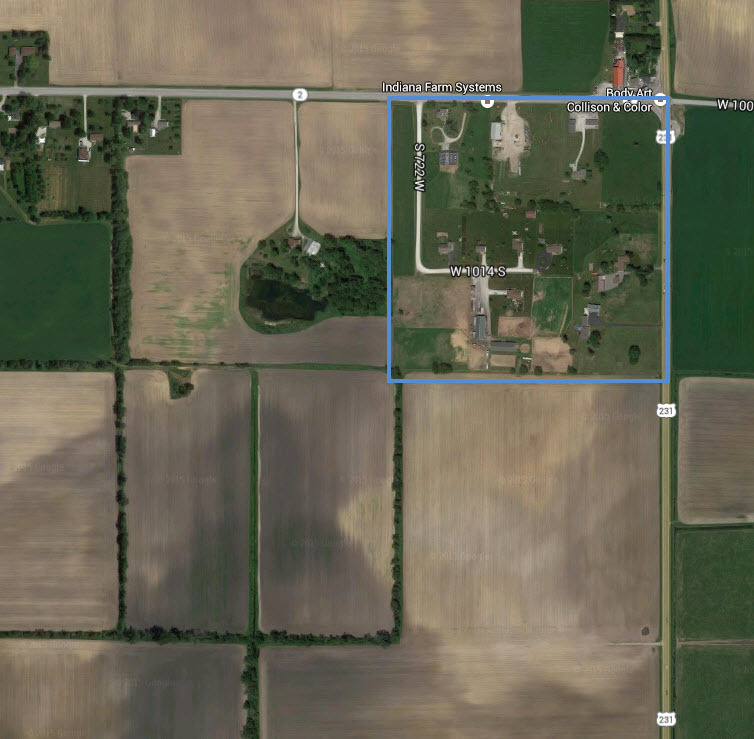 The Archaeology of Porter County. 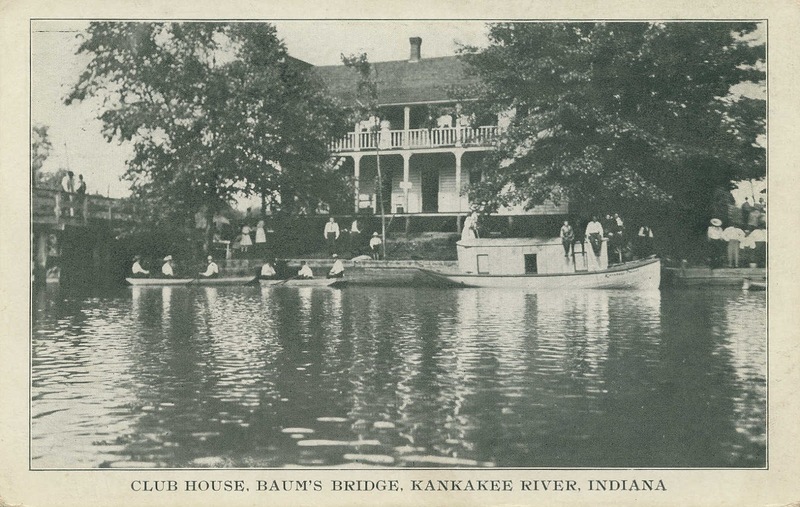 Indiana History Bulletin 10(1):1-96. Nelson, C. W. 1949. The Bailly Cemetery. Manuscript in Reed Folder. Porter, Indiana: Indiana Dunes National Lakeshore Park. pp. 11-12. Skinner, Hubert M. January 15, 1878. Complete History of Porter County. Valparaiso, Indiana: Published by author. Writers' Program, Works Progress Administration. 1936. Porter County, Indiana, Folder 146. Terre Haute, Indiana: Indiana State University, Cunningham Memorial Library. pp. 294-296. The Chesterton Tribune, Chesterton, Porter County, Indiana; October 11, 1901; Volume 18, Number 27, Page 8, Columns 2-4. Column titled "Looking Backward, An Old Timber's Narrative of Porter County, Indiana," by John O. Foster. The Chesterton Tribune, Chesterton, Porter County, Indiana; July 25, 1902; Volume 19, Number 16, Page 1, Column 6. column titled "Hobart." The Chesterton Tribune, Chesterton, Porter County, Indiana; February 22, 1906; Volume 22, Number 47, Page 1, Column 4. Column titled "Found an Indian Grave." The Chesterton Tribune, Chesterton, Porter County, Indiana; October 7, 1909; Volume 26, Number 28, Page 8, Column 1-3. Column titled "Effaced Footprints on the Sands of Time," by Frances R. Howe. The Porter County Vidette, Valparaiso, Porter County, Indiana; August 23, 1916; Page 1, Column 4. Column titled "A. E. Upp Finds Papoose Plaything on Farm." The Porter County Vidette, Valparaiso, Porter County, Indiana; September 20, 1916; Page 4, Column 6. 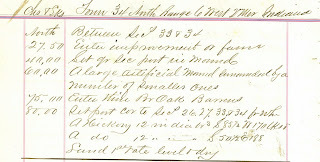 Column titled "Centennial Notes: Geography Notes Continued" by Mrs. L. F. Bennett. The Porter County Vidette, Valparaiso, Porter County, Indiana; January 24, 1917; Page 3, Column 1. Column titled "Local Squibs and Personals." The Vidette-Messenger, Valparaiso, Porter County, Indiana; July 10, 1931; Volume 5, Page 1, Columns 2 and 3. Column titled "Kankakee River Region Will be Searched this Summer for Ancient Indian Treasures." The Vidette-Messenger, Valparaiso, Porter County, Indiana; April 10, 1935; Volume 8, Page 1, Columns 4 and 5, and Page 5, Column 3 and 5. Column titled "Siftings - The Mound Builders," by A. J. Bowser. The Vidette-Messenger, Valparaiso, Porter County, Indiana; August 18, 1936; Volume 10, Section 3, Pages 21-23. Column titled "The Hebron School History of Boone Township: As Compiled by History Class and Instructors for The Vidette-Messenger." The Vidette-Messenger, Valparaiso, Porter County, Indiana; May 19, 1954; Volume 27, Number 270, Page 1, Columns 5-6 and Page 6, Column 2. Column titled "Looks Like Toll Route May Have to Skirt Old Cemetery" by Fred Van Pelt. The Vidette-Messenger, Valparaiso, Porter County, Indiana; June 1, 1956; Volume 29, Number 281, Page 8. Column titled "Indian Burial Mounds Still Dot Landscape in Boone Grove Area." The Vidette-Messenger, Valparaiso, Porter County, Indiana; February 6, 1958; Volume 31, Number 182, Page 1, Column 3, and Page 6, Columns 5 and 6. Column titled "Indian Hills Subject of Much Study." The Vidette-Messenger, Valparaiso, Porter County, Indiana; January 21, 1959; Volume 32, Number 67, Page 1, Column 1, and Page 6, Column 3. Column titled "Cemeteries Remind of Yesteryear" by The Stroller. The Vidette-Messenger, Valparaiso, Porter County, Indiana; July 12, 1960; Volume 34, Number 7, Page 1, Columns 4-5, and Page 5, Columns 1-2. Column titled "Few County People Know Where Sprigsboro Located" by The Stroller. The Vidette-Messenger, Valparaiso, Porter County, Indiana; August 27, 1960; Volume 34, Number 48, Page 1, Columns 5 and 6, and Page 10, Column 5 and 6. Column titled "Astor Trading Post Once Set Up In This Community" by The Stroller. The Vidette-Messenger, Valparaiso, Porter County, Indiana; November 10, 1960; Volume 34, Number 110, Page 1 and Page 14. Column titled "Bodies of 17 Warriors Found in Battle Regalia" by The Stroller. The Vidette-Messenger, Valparaiso, Porter County, Indiana; September 15, 1961; Volume 35, Number 62, Page 1, Columns 6 and 7, and Page 8, Columns 4 and 5. Column titled "Liberty Township Neutral Zone for Early Warriors" by The Stroller. The Vidette-Messenger, Valparaiso, Porter County, Indiana; December 22, 1971; Volume 45, Number 144, Page 1, Columns 3 and 4. Column titled "Does Ecology Play Part?" The Times, Munster, Lake County, Indiana; January 21, 2014; January 21, 2014. Column titled "DNR Takes Over Investigation of Skull Found in Porter County" by John Scheibel [Accessed June 28, 2015]. Great article! Would you have any information on the Indian trails that went through Porter County? Specifically I'm looking for Porter Township Indian trails. There's quite a bit of information concerning Indian trails in Porter County, but it's scattered about in a large number of sources. I'll attempt to put something together and post it here in the near future. The most complete source I am aware of is a booklet by Harry G. Black titled "Historic Tales and Trails in Northwest Indiana." This 63 page booklet was published in 1985 by HMB Publications in Hammond, Indiana (three copies available on Amazon). It's a great starting point, but has lots of holes in it since its focus is on the major trails (like the Sauk Trail). Steve, thank you for your great articles on the history of Porter County. I appreciate your articulate and well-organized writing supported with your exhaustive research. A true pleasure to read!